Nothing's more divine than a piece of fruit-based cake melting on your taste buds. The following cheesecake recipe should be prepared well ahead in advance because it needs overnight refrigeration to get the best results. I've infused both passionfruit and mango with cream cheese base for a strong fruity flavor. If you prefer, you can remove all the passionfruit seeds from the topping. If you find the fruity flavor overwhelming, go for a regular cream cheese base. A firmer baked version of this cheesecake also exists but we'll stick with this one. It's a perfect treat to be included in a kid's party. Let's get started and make this fragrant, fruity, and easy-to-make cheesecake preparation for our loved ones. 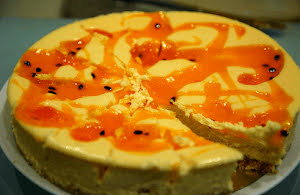 Do make this delicious and moist cheesecake with a dual flavor of passionfruit and mango which makes it an ideal serving for people having a sweet tooth. Combine both crumbled biscuits and butter. Take a spring-form cake tin and make the base (approx. 1/3" or 1/2" thick) with the combined biscuit crumbs and butter. Gently press the base either with a hand or with a flat wooden spatula. Refrigerate the tin for at least 20 minutes. Add cream cheese and refined sugar in a blender and pulse until you get a smooth base. Take a quarter cup of boiling water and mix gelatin powder in it. Add it to the blender with lime juice and whipped cream. Pulse for about 1-1/2 minutes. Finally, add both passionfruit juice and mango juice to the blender and pulse for about 2 to 3 minutes. Pour this cake filling in the tin and smooth out the top. Take another quarter cup of boiling water and mix gelatin powder in it. Combine it with passionfruit juice, passionfruit pulp (with seeds), caster sugar, and fresh lime juice. Whip or pulse in a blender until you get a smooth topping base. Pour on top of the refrigerated cake. Refrigerate again for at least 2 to 3 hours. I'll recommend refrigerating it overnight.